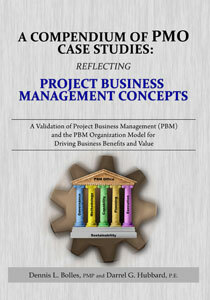 "In this book, Bolles and Hubbard have successfully continued to promote the concept of the business view of project management. Many books on project management take a theoretical approach with a mixture of examples that may not reflect reality. However, this compendium of project management offices (PMOs) case studies is based on the practical experiences of executives and managers regarding the undertaking of projects within their industry and enterprises. It is this practical basis, emphasizing enterprise-wide projects as a consequence of the current economic reality, which differentiates this book from conventional texts on project management. The book through the presented research and case studies provides new insights into practices for undertaking projects that both executive management and project management practitioners will find interesting and useful for the advancement of their enterprises, particularly, the project business management aspect." "Dennis Bolles and Darrel Hubbard have responded to the elusive question about what makes a portfolio/program/project management office (PMO) successful. As we all know, there is no “PMO Cookbook” that we can go to for the recipe to make a successful PMO. But, their unique approach of soliciting case studies from a wide variety of high-performing PMOs provides the reader with practical insights that are readily applicable to their own organizations. It also confirms that there are numerous PMO approaches that are successful, and will inspire the reader with ideas for how to overcome challenges they may be experiencing. This book serves as an excellent reference for anyone who is establishing or running a PMO." "The informed advancement in business discipline has been driven by project management authorities like Dennis Bolles and Darrell Hubbard. They have defined project business management and prescribed the character and structure of project management leadership and organizational structure. Now these two experts with over 85-years of combined experience have advanced the formation of project business management to a survey-based business science. Their new book provides comprehensive definitions and observations of repeatable business project management experiments that form a foundation for sustaining project and process excellence." click this link for More Praises….